Below are a selection of frequently asked question relating to Deer Velvet, click on the question or the + sign to expand and read more. If you require any further information on our products please contact us on +64 7 333 8075 or drop us an email. How Can I be Assured of a Quality Product? Not all velvet antler supplements are created equal. Production costs can be reduced by altering the quality of the raw product. Sometimes the most potent part of the velvet antler, the tips, may not be included in the capsules in order to produce a cheaper product. This end product may look the same, and have an attractive price tag, but it will not be nearly as effective. When you choose Canes Deer Velvet you can be sure you have a quality product that includes all part of the antler for maximum potency. We grow and produce Canes Deer Velvet and sell directly to the consumer, therefore you can be assured of the best quality velvet supplement at the best price possible. IGF-1 Spray and Canes Deer Velvet – What is safe? Canes Deer Velvet capsules at the recommended dose are considered safe for use by athletes undergoing drug testing, and we have several professional athletes using Canes Deer Velvet and undergoing regular drug testing. Concentrated extracts of IGF-1 for sub lingual use are a completely different product and their use may affect drug test results. Some IGF sprays may contain extracts from New Zealand Deer Velvet, and therefore some manufacturers still refer to these products as Deer Velvet which is disappointing. Each spring the male deer grows a new set of antlers. In their early stage of growth these antlers are called Deer Velvet, and consist of cartilage with an abundant blood supply and a covering of velvety skin. Inside they resemble bone marrow. If they are not removed the Deer Velvet continues to grow into bone and eventually become the long hard antler seen on wild deer. During the autumn/winter mating season the stags use these as weapons to fight each other in the quest to be the strongest male. For this reason it is important when farming deer to remove the antlers in order to prevent the animals from harming each other. The hard antlers are naturally cast in the early spring when the new antlers begin to grow again. Fortunately Deer Velvet has a commercial use. When it has been growing for around 60 days it contains the optimum nutrients for use as a dietary supplement and can be removed without harm to the animal. Once removed it is cooled then immediately frozen before going on to be freeze dried, sterilised and processed into capsules. Does removing the velvet harm them? No. We love farming deer and we care about them. All antler is removed by trained personnel, in a humane manner and in accordance with the NZ National Standard’s Code of Practice for animal welfare. Analgesia is used to ensure the deer are comfortable and they can be found grazing happily on open green pastures soon after. Canes Deer Velvet Antler is a renewable resource, with stags growing a new set of antlers each year. These are removed not only for commercial reasons, but also to prevent stags harming each other during the mating season. Why Do We Need To Supplement For Joint Pain? Our diet has changed dramatically over the years. In years gone by soups and stews were always on the cooker and included all the bones and gristle (or cartilage) to prevent waste. They were cooked for long periods to flavour and tenderise. These meals contained an abundance of nutrients including the glucosamines and chondroitin type nutrients that are found in deer velvet. In today’s busy world we tend to eat less of these and more convenient and pre prepared or processed foods. As a consequence many of us a lacking in joint nutrients and are troubled by joint pain. Can You Take Deer Velvet With Other Medications And Supplements? Because Deer Velvet is a meat or bone type product, it is completely natural and unlikely to interfere with other medications. We are not aware of any medication or supplement that cannot be taken with Deer Velvet, but as with most dietary supplements it is recommended that you consult you health professional if you have a medical condition. Please Email Kathy if you’d like to discuss your own situation. If your health professional is unfamiliar with the properties of Deer Velvet please invite them to contact Kathy. Is There Anyone Who Should Not Take Deer Velvet? Deer Velvet is not recommended for people who are prone to allergic reaction to proteins, or those who have any medical condition where improved circulation is not beneficial. I Thought Deer Velvet Was An Aphrodisiac? This is a common misconception, but it does have some basis. Deer Velvet promotes general well-being and healthy circulation (in all areas!) When you’re feeling great you may find improved sexual function to be a very pleasant (we hope!) side effect. Is Canes Deer Velvet Ok for professional athletes undergoing drug testing? 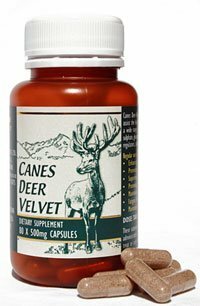 Canes Deer Velvet capsules at the recommend dose are, to the best of our knowledge, considered safe for use by athletes undergoing drug testing. Growth factors IGF-I and IGF-II both occur naturally in deer velvet, but will not raise the IGF levels in the blood abnormally so when taken on its own in capsule form deer velvet will not alter results of a sports drug test. Professional athletes undergoing regular drug testing currently take Canes Deer Velvet, and have done so long term. Canes Deer Products Ltd however accept no liability based on this advice, as they have no control over other aspects of an athletes practices. If you have any questions around this subject please don’t hesitate to contact us. Please note that concentrated extracts of IGF for sub lingual use (some producers of which have use Deer Velvet as a source) are a completely different product, and not recommended for use by professional athletes.